The answer? 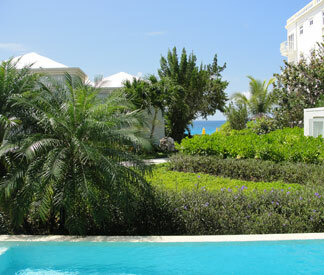 One of Anguilla's most coveted boutique resorts, Meads Bay Beach Villas. 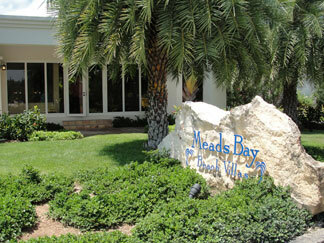 "Where are the Meads Bay Beach Villas? I see the sign, but I don't see any villas... 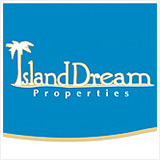 I see Frangipani Beach Resort, I see Turtle's Nest, but where is Meads Bay Beach Villas?" Finally, I have the answer! 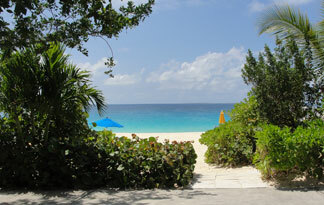 Meads Bay Beach Villas sit on a very narrow piece of property between Frangipani and Turtle's Nest. 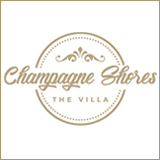 You actually can see their Villa #1 unit from the beach but you have to know what you are looking for. 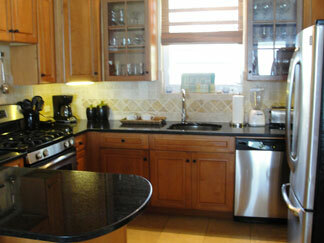 The owners and planners of this property really did a wonderful job of keeping its villa-style units very private. 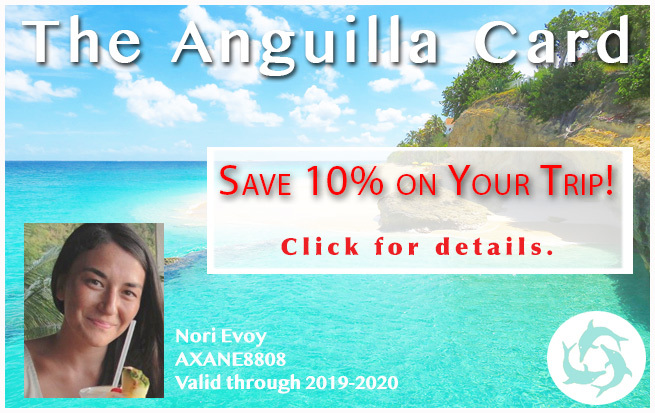 Let me explain this boutique resort in greater detail and take you on a tour of this boutique Anguilla resort, just as Chris (the Owner's Representative) did for me. 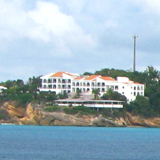 Meads Bay Beach Villas is very easy to get to via automobile. 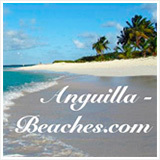 You simply drive as if you are going to Meads Bay in the western end of Anguilla and look for their sign. Again, they sit between Frangipani and Turtle's Nest. All three properties are well-marked. There is a small parking area for their guests just on your left as you pull in. The office building is on your right. I met Chris in the office and we walked through the grounds. As we did, he gave some background information on this property. This boutique hotel was built between 2005 and 2006. It was designed by Ian "Sugar George" Edwards. 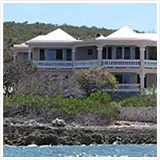 If that name sounds familiar, it may be because you have read about him designing Tequila Sunrise Anguilla villa. We weren't far along on the tour when I interrupted Chris. I couldn't focus on what he was saying as I was taken aback by the grounds! Who knew such lushness existed on Meads Bay? 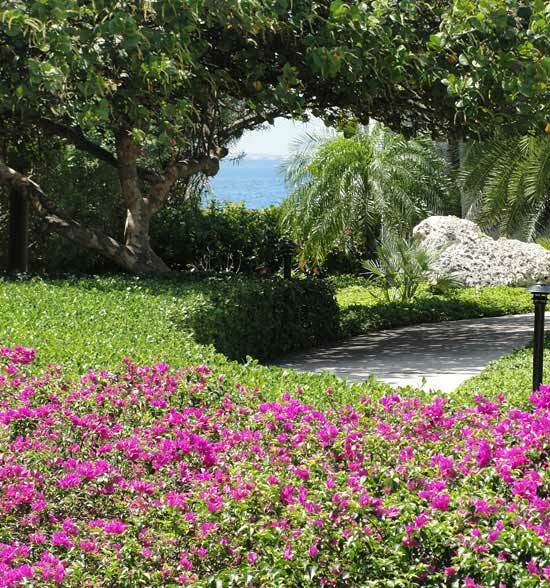 It is clear the staff takes pride in keeping your short walk to your villa unit as private and as beautiful as possible. 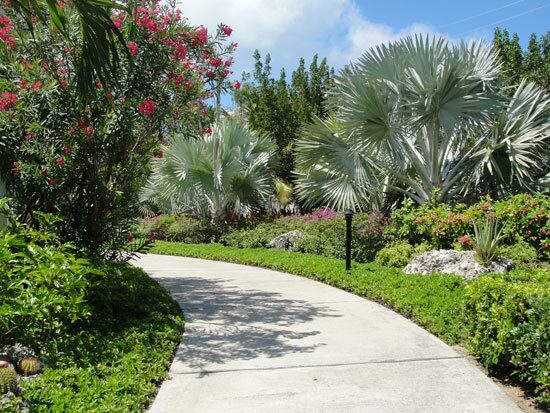 The walkway is lined with the Bismarck palms that are incredibly exotic and look like human-sized fans. The plants offer so many varieties of green, your eyes aren't sure where to go first. All of this abundant green is accented with splashes of color from blooming flowers. Chris assured me he is accustomed to getting this reaction from first visitors as their expectations tend to be exceeded. Not a bad way to start the tour! 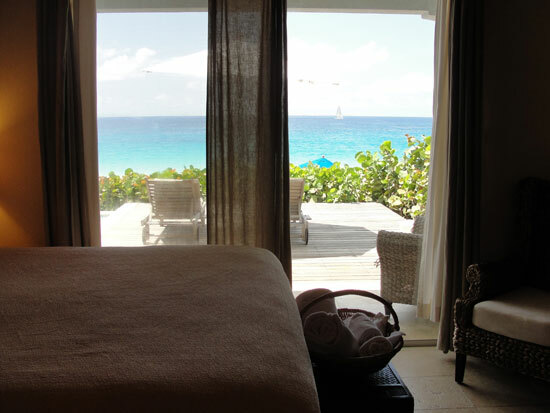 Meads Bay Beach Villas is a peaceful and private boutique Anguilla resort. There is no central pool or lounging area. 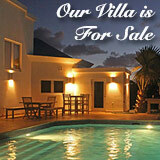 All of the units are large private villas. 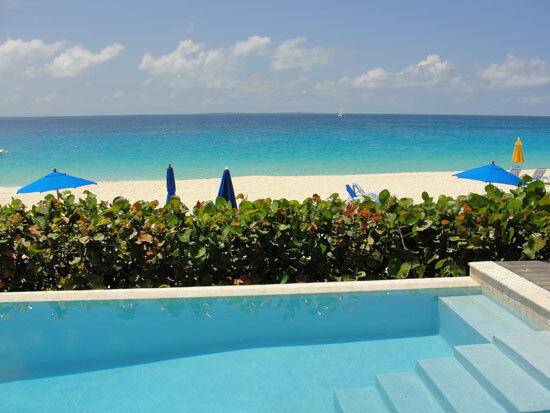 At Meads Bay Beach Villas you have the privacy and space afforded by Anguilla villas, and the service and concierge cares of an Anguilla hotel. We walked past villas 4, 3, and 2 to enter the beach front villa #1. The cut-out to the beach is directly ahead. A sharp left, up just a few steps and we are on the patio area of villa #1. The pool looks so inviting - it is the first thing I notice. The beautiful blue pool is hidden from passers-by on Meads Bay by a thick hedge of sea grapes. This sea grape hedge is my first clue as to why some people have a hard time determining where the Meads Bay Beach Villas are from the beach. This pool area has plenty of comfy looking loungers a large table and covered and uncovered outdoor areas. Ideal! We step inside and the staff is getting the villa ready for new guests that are arriving that afternoon. It was very comfortable inside and laid out nicely. The living room and kitchen are open to each other and are central. The living room is the room closest to the pool. The kitchen is in the back of the villa. A bedroom flanks each side of the living room/kitchen area, each with its own spacious bathroom. A powder room is just off of the living room. There is closet space in case you like to "move in" to your vacation villa. The furniture and decor is in simple and nice, with a slight Caribbean influence. Chris explained that they would soon be doing some redecorating of the villas and that I should come back and see it when they are finished. I must have looked at him strangely after he told me that because I couldn't understand why they would be doing anything different with this special place! The furnishings are quite tasteful and not outdated. His reply was that so many of their guests are repeat guests and they like to keep it fresh for them. 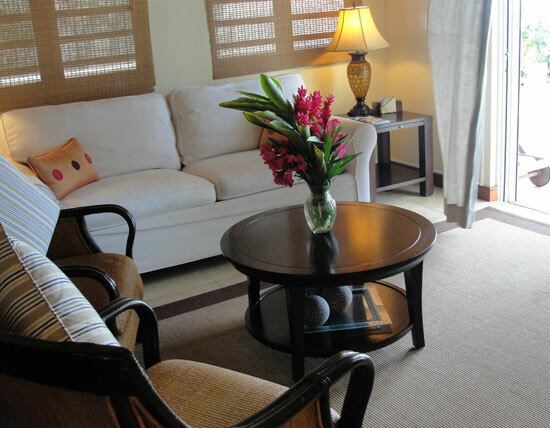 Meads Bay Beach Villas is the kind of hotel that pays attention to their units (their villas), is aware of any wear and tear, and upgrades and renews. We exit villa #1 and backtrack through the property past villa #2. Even though it doesn't sit literally on the beach like villa #1, it still has a nice view of the turquoise water. The bonus about the views from villas #2, #3, and #4 is the landscaping. 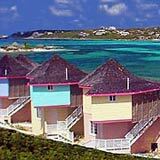 You can see the water of Meads Bay from all villas but #4, which is more of a garden view. We walked to the pool area of the occupied villas #2 and #3. The guest in #3 came outside and spoke to Chris. 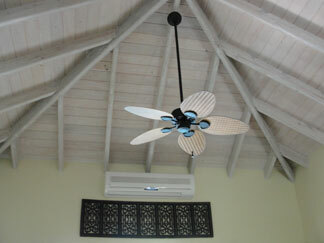 These guests were repeat guests of Meads Bay Beach Villas. Villa #3 is his favorite. For him, nothing can beat the view of the garden area and the blue sea beyond. I noted that in the space where you have the sea view from this villa, you can even see Prickly Pear island way offshore. The guest asked Chris if everything was still on for their afternoon boating adventure. Chris assured him it was all set and the boat would be right out front in the water. 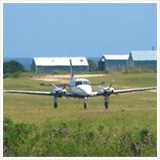 Chris is very professional and on top of things, yet very easy-going and personal. This warm "feel" was what I was getting in general from being amongst the staff and guests. We said thank you and goodbye and headed over to the last villa, #4. 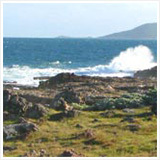 This one is the farthest from the beach, however less than a minute walk to the beach path. It also had a few more stairs leading to the entry. As with villa #1, villa #4 was very nice and equal in almost every way except it has the outdoor shower. 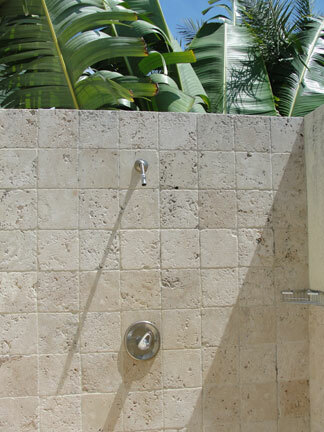 Outdoor shower... now that's an amenity! The pool area is very spacious, too. The outdoor table which could hold 6 was not squeezed in... it was surrounded by open space. This continued the feeling of space and privacy as I felt throughout the tour. Chris said that many of their guests are 2 couples traveling together. They can be together and share the villa, yet still have room to be alone, read, lounge and not feel cramped. As the tour came to an end, I couldn't help but notice how private each villa unit really is, and how peaceful too. The grounds were quiet even though 2 villas were occupied and 2 were being prepped for new guests. 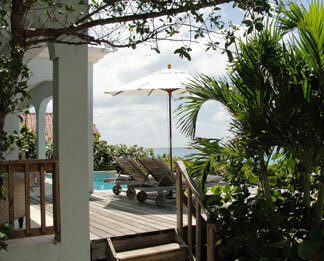 What Makes Meads Bay Beach Villas So Special? Without a doubt, in terms of setting and scenery, Meads Bay Beach Villas is impressive. 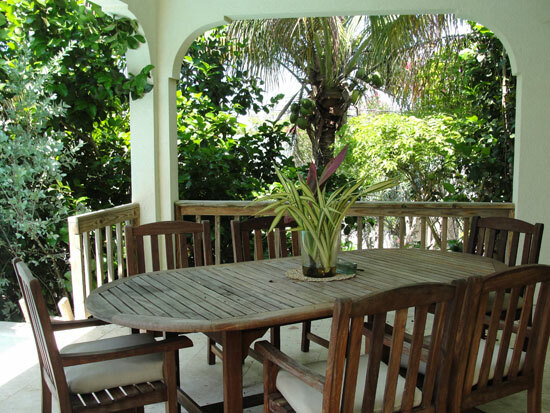 Speak with people who have stayed at Meads Bay Beach Villas, and they will tell you about the beautiful surroundings, and the comfort of their villa. But, that's not what keeps them coming back. 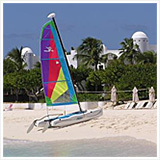 Impeccable service and the friendly and welcoming nature of the staff defines Meads Bay Beach Villas. Just after being there for a short afternoon, that feeling of family stayed with me all day. she is genuinely friendly and happy to do it! I met Delta as I was getting ready to hop in my Jeep and pull out of the parking lot. She was standing by the entrance, smiling. She told me that she was responsible for getting the groceries for their guests. With her was Lollie who was on her way home for the day. 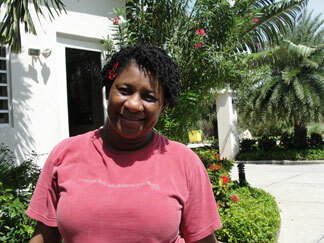 She is one of the ladies who cleans the villas and has been on staff since they opened. I gave Lollie a lift home as I found she didn't live too far from me. During our ride she spoke highly of her employers and was so proud to be a part of Meads Bay Beach Villas. She solidified the family feel that I was picking up on. 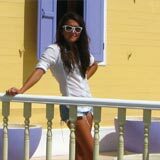 I found friendly and respectful, professional people who make you feel completely at ease. That feeling of comfort and home, coupled with pretty, adequately sized villas complete with their own pool and on Meads Bay... that is a win-win.